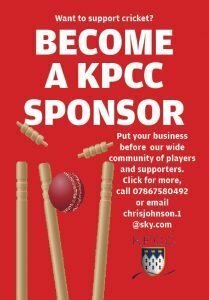 Adam Sergeant led Knebworth Park’s romp to a comfortable win by seven wickets over Kings Langley on Saturday in Saracens Herts League Division One. It capped an excellent day for the Park winning three out of four of the club’s league matches. Sergeant’s ruthless innings of 84 not out, including 13 fours, saw him dominate the visitor’s bowling on a superb batting track at Knebworth as they chased a below-par score of 174. Sergeant, pictured, was supported in a stand of 98 by Ryan Skeggs whose 42 not out included a huge six that rattled against the pavilion roof. Opener Mo Asif, who had earlier bagged five wickets, gave the innings a bright start with 19 which was carried on by No 3 Tariq Umair (17). The Park’s run fest of 177 for 3 saw them win with almost 20 overs to spare. Earlier, the Park had lost the toss and Kings Langley chose to bat first. They were pegged back, particularly by Sam McCrow with 2 for 26 off ten overs. But after Harry Sambrook (44) and Paul Ashford (20) had taken them on to 80 for 2, they then crumbled to 113 for 8 against the spin of Asif who took 5 for 29 including a sharp caught and bowled and the accuracy of skipper Guy Warman with 0 for 23 in ten overs as well as Matt Hutchinson’s 3 for 25 off eight overs. No.5 Liberty Maher (36 not out) and a belligerent 41 from No.10 Varman Ratnakumaran hoisted their total. Archie Stephens’ half-century and three wickets fired the Seconds to victory over Cheshunt in scoring 226 for 5 and then bowling out the home team for 123. 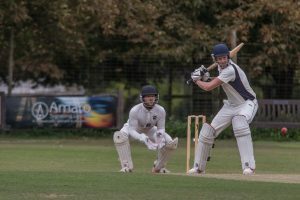 After the early loss of Rob Morley, Stephens and opener Tom Liversidge batted with patience and poise to see off the new ball, dispatching the bad ball with ease. A partnership of 95 came to an end when Liversidge fell for a very well made 58. Stephens fell not long after for an elegant 57 and a flurry of wickets left Knebworth on 171/5. An excellent partnership between Ross Courtney (34*) and Lewis Hutchinson (25*) lifted Knebworth to 226/5 after their allotted overs. Cheshunt’s reply started well, reaching 40 for no loss after nine overs. It was the introduction of the evergreen Graham Fisher which broke the partnership and stemmed the flow. Fisher tied the Cheshunt batsman down, finishing with incredible figures of 10-6-12-3. He was brilliantly supported by the eventual man of the match, Stephens, who bowled with control and finished with figures of 7 overs, 3 for 16. There was no real way back for Cheshunt after this tight bowling and excellent fielding, including four sharp catches in the slips by Alex Richmond, and the tail was cleaned up by the opening pair of Gareth Jones and Ollie O’Brien. 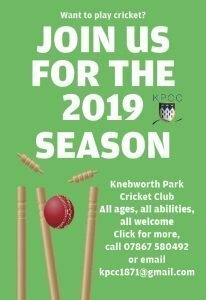 Cheshunt were bowled out for 123 handing Knebworth a victory by 103 runs. The Thirds got the rewards for their promising start to the season,picking up their first win of the season at Watton-at-Stone. Having chosen to bat first, Park got off to a great start with Danny Digweed and Spencer Bayford putting on 92 for the first wicket before Bayford (35) was dismissed in the 23rd over. With a solid platform built, Park kept their momentum despite Digweed being removed for an excellent 55. Ian Pickering and Ian Woods continued the good work, taking the score from 117-3 up to 196-5 before Woods (40) was dismissed with just three overs left. Having reached 63, Pickering was dismissed on the last ball of the innings having helped Park up to 219 from their 50 overs. Park took to the field full of confidence but despite some tight bowling, it wasn’t until the 15th over that Park picked up their first wicket through Mark Taylor with the score on 45. A second wicket for Taylor (2-23) quickly followed and Watton began to fall behind the run rate. Despite some big hitting, wickets continued to fall at regular intervals with the returning Rob Crowe (2-18) and Jack Randall (1-26) making inroads into the Watton middle order. With the score on 98-5, Park were well in control but they were made to work hard to see out the innings and it was left to Ben Childs (3-30) to pick up the last few wickets with Watton eventually being dismissed for 189 in the 47th over. There were also wickets for Woods (1-25) and Pickering (1-46) as Park built on their solid performances of the last two weeks. After a useful start, the Fourths slumped to defeat against Stevenage V, scoring only 106 in reply to 248 for 6.